Moyna’s cousin panted at the doorway, heavy with child. “Who did this to you?” her father shouted. And Moyna knew that somehow she would be blamed for this unspeakable shame on the family. Her aunt blamed her for all the tragedies, from the death of Moyna’s own parents to the riots in Bombay. But, as her cousin lay dying of stab wounds, Moyna promised to protect the baby. 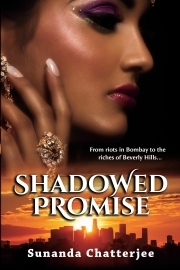 A story of friendship, redemption, and forgiveness, Shadowed Promise is a journey from blind faith to triumphant love.